Is a swamp monster stalking Bolingbrook's DuPage River Greenway Bike Path? Several eyewitnesses say yes. Mark Olson says he saw the monster while walking his dog. "Jinks, my dog, just started barking. He normally doesn't bark. Well he doesn't bark a lot. Anyway, he started barking at this pile of grass. I told him to shut up, but he just kept barking. When I bent down to smack him, I noticed the mound move. Then I thought that it looked more like a pile of moss than a pile of grass. Before I could do anything to Jinks, that pile stood up. Jinks started to run, and followed him. I even made sure to watch my footing, because I've seen enough horror films to know what happens when you don't." Jed Williams also saw the monster while meeting with some friends. "Hey, I was just meeting my, um, friends. We were talking and stuff, you know. It was at night, and we wanted to see the stars. Then I heard some rustling in the bushes. I pulled out my pistol, which just had on me for protection. I told him to show himself. This thing, with twigs growing out of its body, stood up. It said something in a weird language, and approached me. I opened fire, but the bullets just went through it. I ran towards the well lit parking lot, because I know those monsters can see in the dark, and I can't." Alicia James took the first photograph of the creature while she was riding her bike. Ironically, she was on the bike path to show her daughter there was no monster. "I thought she was just scared of a pile of leaves. So I was going to take a picture of them, while my husband comforted her. 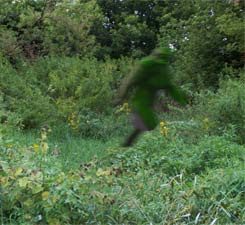 Instead I saw this green Bigfoot strolling along the path. I pulled out my digital camera and took a few pictures. It looked scary with its glowing red eyes, and it said something in a weird kind of French. But he didn't threaten me. I thought it was kind of cool." Because the monster sightings started shortly after the remnants of hurricane Gustav passed over Bolingbrook, Cryptozoologist Megan Stevens believes the creature is a Louisiana Swamp Monster. "These creatures reproduce by releasing spores." She said. "So I believe the hurricane brought some of these spores all the way to Illinois. It's unusual, but not unprecedented. A hurricane once brought a swamp monster all the way to Canada. The poor thing froze to death a few weeks later." Stevens believes that once the Parks department takes the reports seriously, they will hire her team to capture the monster and return it to Louisiana. "I offered this creature to the University of Chicago, but they laughed me out of the building before we could discuss my fee. As far as I'm concerned, it's science's loss." In the meantime, Stevens urges everyone to keep their distance from the monster. "It is a very dangerous creature. Let me make this clear. It is not a misunderstood creature. It is not some kind of avatar of nature. It is not here to warn us about pollution. And it is not a friend of Native Americans. The tribes of Louisiana survived by keeping their distance from these creatures. You should too. Let the experts, like me, handle this!" When asked to comment, a spokesperson for the Parks Department laughed, and hung up the phone. Distant comet helped Bolingbrook defeat Downers Grove South 21-20.